Do You Understand the Difference Between Senior Care Options? Do You Understand Senior Care Options? Senior care options are tricky to navigate, especially when you don’t know where to start. For many people who are just starting to care for a senior, not knowing is more common than not. Luckily, there are a variety of senior care options for your loved one. That means you can start to weigh your options based on the type of care you need while skipping what you don’t. Knowing is half the battle. In this blog we’ll be discussing 8 major senior care options and the level of care they can provide. This is the general retirement home that comes to mind for most people. From the elderly apartment complex down the road to the fully furnished home, your loved one can take advantage of these facilities without losing their independence. This is the option for the realistic person who simply wants a bit of extra help in their day-to-day, but aren’t ready for assisted living. Most who choose this route are looking for someone else to pick up the daily slack of trash and preparing meals, but still need the freedom to simple come and go as needed. Monthly rents at these facilities also include call-for-aid systems too. An assisted living care community is also referred to as a personal care home. These facilities provide around the clock staff to help your loved one get on with their everyday lives. Community activities, dining, and constant care are just a few of the major benefits of an assisted living community. Others include medication management, fitness programs, and personal hygiene assistants. Many of these communities also provide transportation services, so residents can continue to get out and about on their time. Unfortunately, assisted living homes can be vary difficult to navigate. Some itemize care elements and charge individual- others package everything together. Never forget to ask them to itemize every service they will provide your family. Nursing homes are care focused facilities for loved ones that truly can’t care for themselves. Also known as a long-term care facility, a nursing home employs a nursing staff to take care of patients 24/7. That means care for their feeding, lifting in and out of bed, medications, and even a potential for on-site surgical care. The best nursing homes will offer even more extensive care than mentioned above. The top tier facilities even offer rehabilitation programs, therapy, and so much more. If your loved one is in need of care on a day-to-day basis, a nursing home is the way to go. When your loved one’s memory isn’t what it used to be, and they have started to wander off, get lost, or forget doctor’s appointments–They may be suffering from one of the many forms of Dementia like Alzheimer’s or Vascular Dementia, and they need constant supervision. These facilities provide your loved one with a constant eye to make sure they stay safe and stimulated. Memory support facilities also loved to take personalized approaches to the care they provide. This is important since dementia is an individualized disease. Respite care is often referred to as adult daycare. These short-term stay programs are a great way to meet in the middle with your loved one, especially if you are working during their care hours. Better yet, this is a great way to help your parent get out of the house while you’re at work. The temporary nature of respite care let’s your loved one stay with you and the family at home, and still get out and about during the day. These programs do not offer night time care assistance. Sometimes caring for a loved one at your house doesn’t always cut it for them. As their care needs start to grow, often time your loved one will want to be closer to home. First off, don’t take offense to that situation should it happen. Instead, look for a residential care facility in their hometown. These homes are just care facilities run from the comfort of a person’s home, so the amenities and abilities of the home may vary greatly from place to place. Generally speaking, they are not equipped to assist those with acute conditions. That’s OK, it just means you need to shop around for a good fit. There is no place like home, after all. If your loved one is truly set on the idea of there is no place like home, you can always look into in-house home care companies. These companies provide your loved one with the services they need directly to their home. As a heads up, this often results in a one time fee for them to install the proper care equipment in the home. After you have everything you need for your loved one, it’s an hourly rate for assistance. Hospice care is for those loved ones in the final stages of an incurable disease. This service is aimed at extending the quality of life for your loved one instead of finding a cure. 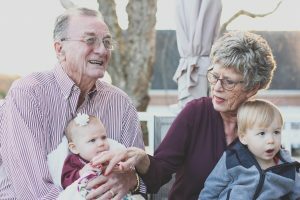 These facilities are the hands you will trust with your family member’s final days, so make sure to find a facility the puts a big emphasis on dignity and family. Make sure the place you choose loves your loved one they way you do. There are a variety of senior care options available for you and loved one to choose from. From simple in-home assistance to full blown care for your loved one, there is an option that can suit anyone’s needs. Make sure you take the time to consider all of your senior care options, and weigh the pros and cons of each option. If you are still in the dark about what steps to take next, please reach out to Above and Beyond Senior Care Placement. We offer free senior care placement services, so you can breathe easy as we help you work through the options. There is no bias, just options. We want your loved one to get the care they deserve and the care they need.